Charmed is fiction but witchcraft is real. This blog explores real magick brought up in the show episode by episode. After the credits the three sisters come back together in their ancestral home, the Mabon night stormy with a full moon. The sisters play with their mother’s spirit board. The spirit board gives them the message “attic” and the lights go out. 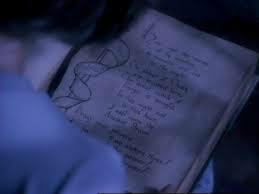 Pheobe goes to the attic and finds the Book of Shadows and begins to read the spell to unleash their powers. After this initiation the witches find their powers in normal everyday circumstances. Phoebe, having read the book, informs her sisters that evil will now be attracted to them so that they can use there powers to fight evil. They fight the warlock Jeremy by casting a spell on him, only to have an altercation with him in the manor. This episode has some vocabulary for us to talk about. The Spirit Board or Ouija board is a board with letters, salutations, and answers, that is used to comunicate with the spirits using a pointer or plachette. A Book of Shadows is a witch’s journal and notebook where they record their spells and rituals and anything that they feel is necessary to pass on or remember. In the Charmed universe the book of shadows seems like a living connection to their ancestors. The sisters have unleashed their powers in this episode. In the real world, not many witches come from an unbroken witchcraft line that goes back as far as in this show. The Charmed Ones come from a Family Tradition, which is when a family practises witchcraft and passes on what they know to their decendants. This is rare, because most magickal traditions are shunned in our world. Hopefully as time goes on and magickal traditions are more accepted this kind of family tradition will become less rare. Most witches don’t have a tradition handed to them. We have to forge our own way by learning from books, teachers, and our own experience. Though some of the lucky ones have family members that do pass on interesting magickal facts and talents. Like in my own family, my grandmother uses my grandfather’s ring to dowse for answers from the spirit world. My father and grandfather used dowsing to find electrical lines, wells’ and water under the ground. These are just a few of the things they passed to me. I have used my own dowsing skill to find my keys in the bottom of a lake. What happens when Phoebe reads from the Book of Shadows would be what we call an initiation in the real world. An Initiation is a ritual to induct someone into witchcraft. It can also pass along a current of the tradition and connect you to all the energies of that tradition. Initiations can be done as a solitary witch on your own. Much like an attunement in Reiki, they can open up powers and skills the witch may have not had before, or enhance the ones they already have. There is a saying in the Craft that “witches are born not made.” This saying is a way to say that witchcraft is in the blood of the witch and is hereditary. Psychic powers are reported to travel in families and sometimes skip generations; this is true with witch powers as well. It is not the only way a witch gains their power and abilities, however. Witches can get abilities from past lives, teachers, and their own work. In the Charmed universe the witches enherit their powers by blood, in real life we have to work to gain reliable abilities. The initiation is sometimes believed to make you a witch, but it is really doing the work of the witch that makes you a witch. Initiations can help to help us be reborn as a witch thus making us a witch through symbolic and ritual rebirth. Initiations can happen through life experiences as well and our ritual initiations are designed to give us that experiance. Whether you’re born, apprenticed, or self-made anyone can be a witch, it takes talent, work, and experience to get good at it. A new generation of witches have grown up watching Charmed. Like it or not, it has become part of the pop culture of Witchcraft. I am going to attempt to use this blog to delve into the Charmed series to use its themes to educate about the real magick it just touches on. In the pilot episode: “Something Wicca This Way Comes” a lot of information is given to set up the series. The episode starts with a blond witch lighting candles with her fingers at her altar and, in a sing song voice, invoking generative solar powers to bring safety into her circle. A man she recognizes kills her with a blade. We later learn that she is a solitary witch who was celebrating her sabbat. To get to the real magick, I want to get to some terms witches use and what they mean. A solitary witch is one that practices the art and science of witchcraft alone instead of with a group or coven. A Sabbat is a ritual celebrated on or near a sacred day. There are eight Sabbats celebrated by most witches today. Not all witches agree on how they are named or observed. Mabon/Autumnal Equinox – September 21 or 22nd. The most important one for this episode is Mabon since that is the Sabbat being celebrated by the solitary witch in the show. Sabbats are magickal times in the year celebrated by witches because they are the spokes of the witches’ wheel of the year, a symbol of time and the movement of the earth through out the year. On the Sabbat days it is believed by some witches that we can participate in the turning of the wheel, bringing greater harmony to the world. These Sabbats are special times where the veil between our world and the spirit world is thin. Depending on the Sabbat, different types of spirits can be contacted. They are also powerful days to do magick because you can tap into the power of the wheels turning. So back to our first scene: The ritual she is doing is a sabbat. Why she has not locked the door when she is doing ritual is beyond me. When you are going to go about ritual make sure you won’t be disturbed. Take the phone of the hook, make sure your kids are watched and occupied, and your door closed and locked. The solitary in the episode talks about her circle round in her invocation. A circle is a type of sacred space created energetically by the witch as part of ritual to protect the space form unwanted energy, contain energy raised and called within, and to create a sacred space or temple where the spirits and man can meet. Usually a circle is drawn around the witch clockwise around the area being used for ritual and four Guardians are called representing the Aristotelian elements of Earth, Fire, Air, and Water. The man in the episode doesn’t seem to be stopped by her circle. In real life he wouldn’t be either, but he might feel his crossing of it. I have witnessed people going through a circle and experiencing headaches after. I have had pets come up to the edge and stop and wait until the ritual was done and some that just crossed the circle without disturbing it at all. The witch in this first scene is stabbed with a ceremonial knife called an athame. It is usually a two-edged blade used in ritual to direct energy and to cast the circle. Depending on tradition it represents air or fire in the circle. In the Charmed universe it is used to steal powers and stab people. One of the prohibitions I learned as a young witch was that your athame should never have touched blood or it would have to be cleansed. Some believe the athame should never be used to to cut anything physical. I have since learned that not all witches practice the same prohibitions but when they allow their athame to touch blood it is their own and is a way of making a stronger connection to the power of the tool. I am still a bit squeamish about using blood in any act of magic, myself. Lastly, I have to talk about the lighting the candles with her finger in the first scene. Can witches light candles with the power of there minds? I have lit them with the power of a Bic or a match but never with my mind. I have never put much energy into trying to light things with my mind. I can report trying to help a fire along with my mind after it has been lit but what winter camping Boy Scout hasn’t? I have met two witches that report to have done it. One relit a candle just after snuffing it by blowing gently on it. She couldn’t do it with enough regularity needed to call it a power. The second lit one candle with a normal means and concentrated very hard on lighting the next with the energy from the other candle. She reports that the fire leapt from candle to candle and lit the other one. She uses this story to teach her students not to limit themselves by thinking something is impossible. I quite agree. We’ve already covered quite a bit and we’re only up to the opening credits! In Part 2 of this blog, we’ll look at some of the rest of the first Charmed episode and what it has to say about Witches, Witchcraft, and the Power of Three. In this episode a young Chinese-American is murdered and his ghost finds the Charmed Ones to help him catch his killer and get his body buried properly before Yama can catch him and take him to hell. While all this is happening, Phoebe is using her power as a lounge psychic to earn money for a present for Prue. She sees these actions not as personal gain, because they are for her sister, but it backfires when she has a vision from a man’s wallet about his death, bringing her back to the purpose of her gift. Talking to ghosts and spirits is an ability witches can learn. Communicating with the dead is called necromancy or the more politically-correct mediumship. We use mediumship now because necromancy comes with lots of baggage and misconceptions. Necromancy is specifically forbidden in the Bible, even though the Witch of Endor does it for one of the kings in it. Necromancy is divination to communicate with the dead, this can be through journey work, scrying, having a channeled conversation through a medium or anyway method you would talk to the dead. Necromancy is used loosely to talk about reanimation of the dead, enslaving spirits to do your bidding, and making zombies in movies and books. Unfortunately this is not a proper use of the word since it means Necros = dead and Mancy = which is used to denote divination. Necromancy is used to talk with spirits to ask them for advice because they have a different vantage point than us, and sometimes to ask them for assistance in manifesting goals. Mediumship relies more on psychic power than the use of ritual and magic. Not all witches use this ability; some have the ability and use it only for themselves and others use it to do public readings. Not every witch engages in medium work, only the ones who seem called to it. In the Charmed universe they seem to overlook that this ability to see spirits is a power in and of itself and that not all witches can do it. They explain it as they must be able to see the ghost because he is an innocent they are meant to help. In real magick witches can experience the dead, but don’t have to. Speaking to spirits and the ancestors it is said to be easier when the Veil is thinnest at Samhain and Beltane. Witches also perform psychic readings. Most witches charge for the service because they are using their experience, energy, and time to help their client. In the Charmed universe this is a taboo, because one is not supposed to use witchcraft for personal gain, which Phoebe attempts to get around by using the job to get money for her sister’s birthday present. Even though she is skirting the rules of her universe, she is put in place to help an innocent avoid death and meet the spirit who is central to the story arc, to serve the greater good. If she had not been doing readings, the Charmed Ones would have never done the good that they were to do. So why shouldn’t she get paid for it? Psychic readings are just one way that witches use their abilities to serve the community in real life. Just like in our story, this can put them in a place where they can do even greater service to people in need. But to be able to have the time to do this and to be able to feed themselves, they must charge. Not all witches agree on this charging for the use of a spiritual ability. Yama in the show is a psychopomp who captures souls for hell and doesn’t care if they are good or not, just that they have to be gathered. In the real world he is found in Hinduism, Buddhism, and Chinese mythology. He does appear to be a psychopomp for souls to purgatory or hell and is called a wrathful god. He seems to hold a place as judge of souls. It brings me to one of the things I like about this show: they allow many different mythologies and religious practices to coexist within the world they have created.